Manxgirl living and crafting down under. : Of blankets and corn cobs. Of blankets and corn cobs. I gave a wee taster of this blanket in my last post, Belle had moved in, when I put it down for a moment. Well since then, she has moved on and I was able to get the final round of the border done. Not a terribly good picture I'm afraid, but the best of a bad lot, it is rather gloomy here this morning. I wanted to make something low volume, and this little pretty is it, made almost entirely from other peoples scraps and left overs which I purchased from the Sally shop along the road. There are a few pieces of my own in there and I purchased a small ball of white while we were in Auckland, but only because I thought I wouldn't have enough of the palest yarns to continue in the 'light, even lighter and light again theme that I had going. Continuing with the scraps and left overs theme. I'v also shown the beginnings of this one before too. Before we went to Auckland. (If you scroll down on this post you'll find it) I had made it with some very thin stripes, which I decided I didn't like. So they got ripped out! I didn't want to take it along to Auckland as the yarn collection is rather large for a suitcase! So I continued with it once I was done with the low volume piece. 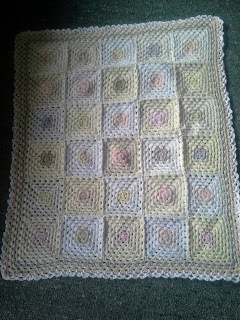 It is a bit of a challenge at times, all of the blocks have nine rounds, but they are all different sizes as they have so many different yarns. It is fun to crochet though and cosy on these cool autumn evenings. Speaking of autumn, the garden got some attention at the weekend. 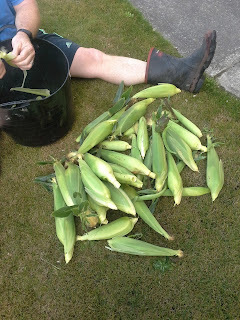 We pulled all the sweet corn. Yummy! We are very pleased with our harvest. It's safely tucked away in the freezer. The green house is still going, albeit slower than a few weeks ago, so we'll leave it alone for a while longer. I do have a bowl of fruit to use up today though, I may make chutney as I was given a new recipe while we were away. I tackled the squash patch yesterday too, many fruits are still not ready for harvesting, but I took what was. That's my gardening glove laid there beside them, just so you can see what monsters they are! 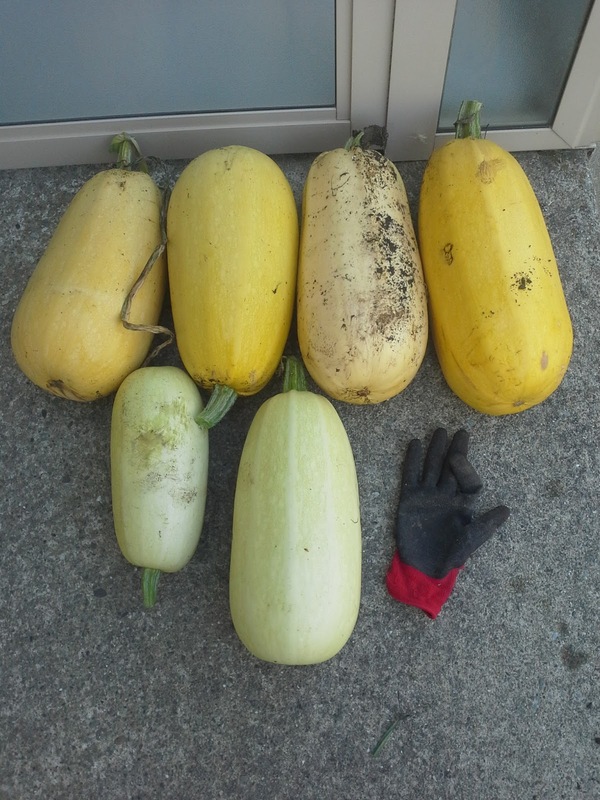 I planted spaghetti squash and butternuts together in the same bed, silly me! The bees were rather promiscuous and I've ended up with four different colours of fruit! There are some darker green ones too. I'm not sure which will have firm flesh and which if any will be stringy like spaghetti. So long as they taste good. I also had a tidy up here and there pulling the last of the carrots and the green beans as well as a few leeks for a pie for dinner today. I planted more carrots a couple of weeks ago and they have sprouted. I'm not sure how they will get on over autumn and winter, I'll keep you posted. I plan to put some broccoli and cauli out soon too. I know they will be fine. Time to go be domestic for a while, then I get to play. The crochet blankets look great--the low volume one came out very pretty. Congrats on your harvest, your time has been well spent! I enjoyed reading your post. 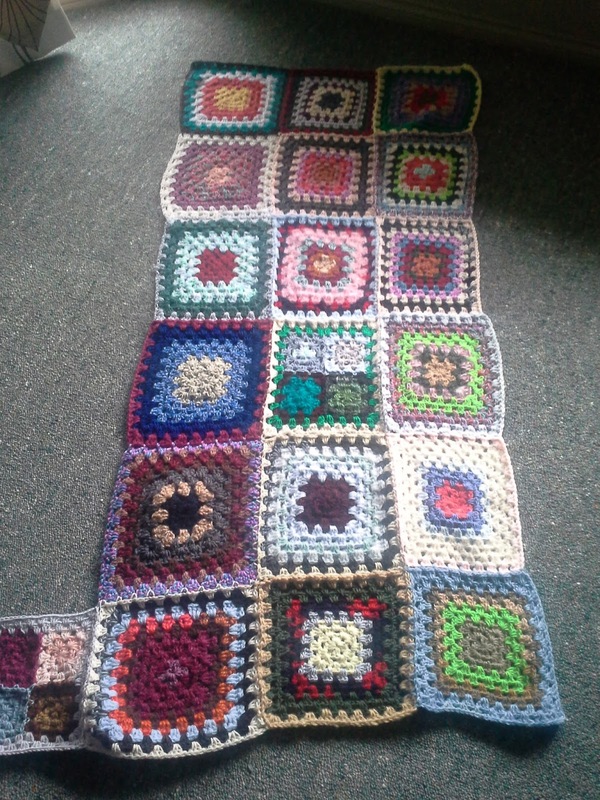 I really like your afghan crocheted from scraps. It just shows that scrap projects are not ugly. The color combinations work very well together. Spring is trying very hard to rear its head here, so I really enjoy seeing your harvest. I wish I lived in a warmer climate where we enjoyed a longer growing season...maybe some day. In the meantime, I enjoy living through the pictures and stories of others. I love your pretty pale baby blanket - really nice!! Your baby rug turned out beautifully. Sweet corn is always good for the freezer. Unfortunately, we just don't have room to grow it now, but not to worry. Our beans have just, in the last couple of weeks, started to produce beans. The plant were covered in flowers, but they just didn't set, until now when the weather has settled down a bit. Let's hope the frosts hold off for a while so that we can get a decent crop. Otherwise, our veges are slowing down too. I need to plant some silver beet for the winter.